Clothes are just not what you wear, they make who you are. 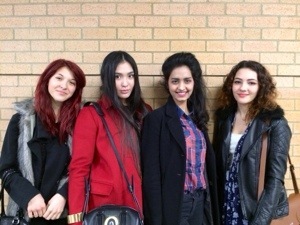 We are four journalist students , exploring fashion on the streets of London. Follow us to keep updated on current trends, trend predictions, opinion pieces and reviews. Hey, I’m Yasmin and i’m the editor here at Street fashionistas. You can usually find me drinking copious amounts of tea, or looking at glossy fashion magazines. My staple clothing item would have to be a blazer – you can dress it up or down but I enjoy wearing it with ankle boots for a bit more edge. Hi, I am Izza or Izzy most preferably. I am the sub editor of this blog. An aspiring Journalist with a lot of opinion. Always on a lookout of new Street styles and spotting new trends (maybe because I have a 3 hour commute everyday).Keeping it classy and elegant is my personal style statement with natural matte make-up to finish the look. Hello! I am Lyubomira, but my friends call me Lulu and I am responsible for designing and developing this blog. Besides, managing the blog, I spend most of my free time reading magazines. But, to be completely honest, I think Cosmo is the best one. As a fashion blogger I love dressing up and I adore street style outfits. Welcome to our lovely blog! My name is Aktolkyn but all my friends call me just Toha. Love reading and writing about fashion. I love experiments with style. It’s all about mixing different colors, adding interesting accessories and the most important thing is that you must be confident and never be afraid to be different!